The Kingdom Keepers saga concludes with the final battle between the forces of good and evil. Three years have passed since the Keepers last had to squash the efforts of the Overtakers (Dark Passage, 2013), but not much has changed when it comes to this series. The characters remain flat, and the adventure continues to seem less like a cohesive story and more like a string of incidents on which Pearson can hang as many nods to beloved Disney characters as possible. Fans will surely thrill at the endless parade of references and action set pieces, but no one will be excited by the stock teenage melodrama. It's hard to care about who's in love with whom and who's jealous of whom when there's an epic battle between the Card Soldiers and Small World dolls going on in the background. The author certainly serves his Disney paymasters well. From the Evil Queen in Snow White to Elsa in Frozen, all eras of Disney are represented. Whether this feels like coldblooded corporate synergy or clever mining of history is up to individual readers, but it's hard not to like a book that features a fight between the evil Jafar and Pumbaa at least a little. Surreal, bizarre and enchanting. (Fantasy. 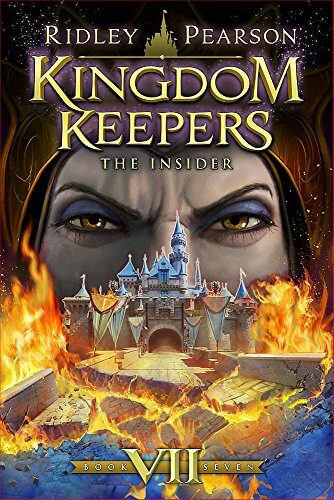 10-14) KirkusReviews.com"
The final installment of the Kingdom Keepers series opens with Tia Dalma, the formidable voodoopracticing witch, winding her way through the Devil's Labyrinth, a rat-infested underground chamber in which she has been imprisoned. She escapes, liberates the beast Chernabog, and transports him to Anaheim in hopes of destroying Disneyland and the "good magic" within it. The five teenagers who have been charged with protecting the park are ready for the pair and battle against them, as well as many other villains of familiar Disney films. The action in scenes occasionally falls flat, and readers accustomed to strong female protagonists may feel dismayed by the sometimes stereotypical depictions of girls. Nevertheless, descriptions of the antagonists are notably rich and evocative, and this will appeal to established fans of the series, who will welcome the conclusion enthusiastically and no doubt appreciate the unbridled adventure they have come to expect from this author. - Julie Hanson Booklist Online"